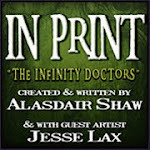 For those of you paying attention this is the direct sequel to 'The Infinity Doctors', as much as Jesse was loving drawing it there just wasn't enough time in the day to fit it in on a regular basis. 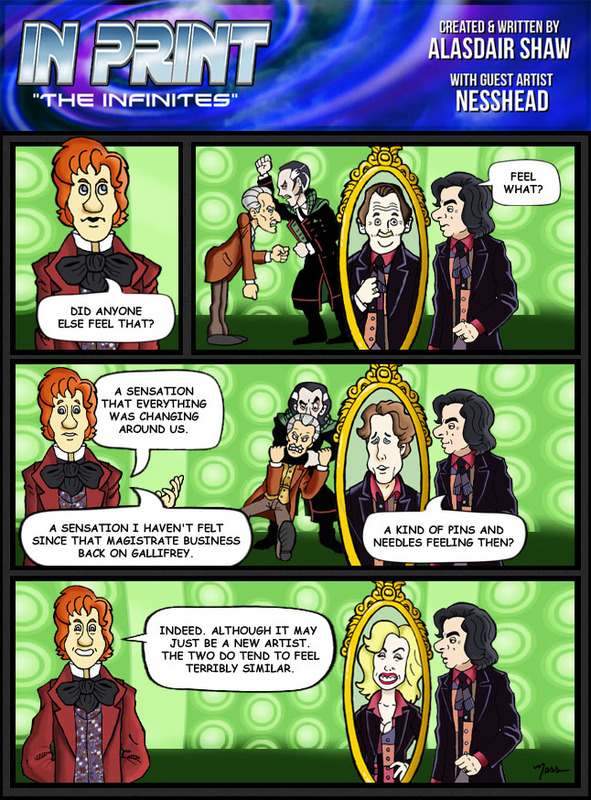 So it's a big thank you to Jesse for starting the ball rolling in such wonderful style a big hello to Nesshead who succeeds him as the regular artist for what we're now calling 'The Infinites'. A role he secured by sending us in the above strip. If it looks familiar that's because he was working off of the same script as Mike Key was when he produced his versions. In fact you'll see this strip one more time as we'll be showing off Tone's version as well in the near future. Nesshead's first full, written for him, strip will be appearing here in a fortnight. So, have I gone too obscure with the joke in second panel? Has anyone got it? I'd love to know as I was rather proud of it. 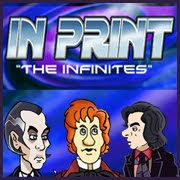 I've also left a subtle hint about which of these guys might actually be the Doctor from the Infinity Doctors, in the 'In Print' Universe at least. I'd love to hear your theories in the comments. In fact I know exactly who each of these Doctors are and how they're all connected to each other and I'm hoping to build up to the reveal in time for November. Although I may end up moving that into next year depending on how my timing of other plot points goes. Either way you guys are going to have to wait for just now, although don't let that stop you speculating in our comments section or on our Twitter or Facebook feeds.